Wasp’s can deliver a painful sting and in some cases Kill. 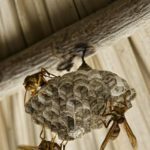 It is best not to approach a wasp nest and call us to remove the nest. Our technicians carry the correct Protective Equipment to deal with the situation and have a solid understanding of the different species behaviour especially when they are defending there nest. 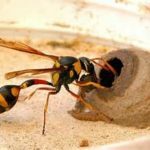 Our technicians will kill the wasps in the nest and remove the nest to prevent the remaining wasps from continuing in the production of the nest causing them to move on. A Necessary Evil, They Sting and have been known to hospitalise or even kill People even in the suburbs. They are however essential to the survival of mankind and must only be destroyed as a last resort. In most cases our technicians are able to safely remove a bee swarm and relocate the swarm to one of our privately monitored hives or even safely release the bee’s into the environment away from residential properties.